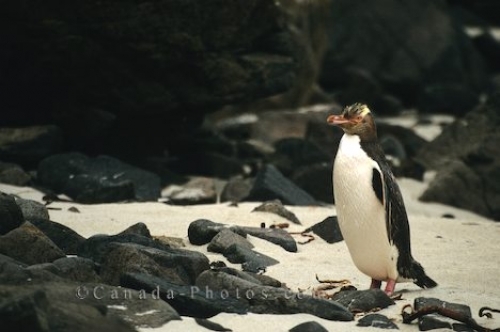 The Yellow Eyed Penguin is the world's rarest penguin and to be able to watch this fellow merrily waddle along the shore on the South Island of New Zealand is amazing. Strolling on the sandy shores between rocks, this cute Yellow Eyed Penguin comes ashore after a long day at sea on the South Island of New Zealand. They trek up the beach and back to their nest in the breeding season until the morning light and then the Yellow Eyed Penguin heads back out to sea for another long day around the New Zealand waters. Picture of a cute yellow eyed penguin waddling along the sand on the South Island of New Zealand.